This book was a bit of a disappointment: Not quite what I was expecting. 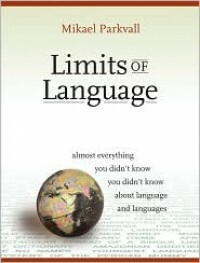 As the author himself notes in his introduction, it's a Guiness Book of World Records-like compilation of factoids about language and linguistics. There's some interesting "stuff" but there's also a lot of "stuff" that's not, and most of the entries are frustratingly short. And - the copy editor in me froths - the typos are legion. The most egregious pops up on page 320 of my edition where the entry "Person Marking on Nouns" is repeated verbatim. The only difference being that the non-English words in the second entry are italicized. And and - the typesetting can be problematic. A lot of entriesgetscruncheddownlikethis or spread out like this. It looks like someone threw the book together on a version of PageMaker.